"I couldn’t recommend this more highly. Scott explains the basic of investing in simple English. It’s solid advice; the kind you rarely get from the talking heads on TV, radio, and the rest of the media. Scott backs it all up with good solid research; this is not his opinion, it’s facts, but presented in a way that your Grandmother could understand." - Dr. Barry H. Kaplan, EA, CFP, Chief Investment Officer, Cambridge Wealth CounselAre you worried and stressed out about not having enough money to retire? Do you have fear of losing your money?Are you unsure of how to build wealth for the long term?Or maybe you’ve been thinking of investing for quite some time now, and you just don’t know how to get started. The whole thing seems too complex and overwhelming. This conversational and action oriented book is for people who want to get started investing (or are thinking about it), but have never understood why or how - no matter your age or how much money you have to invest. Investing has always been made out to be difficult for you, and you think you couldn't do it yourself, much less retire rich. Every time you think about it, you get overwhelmed and afraid of making a costly mistake. You know the drill.You get ready to do something - maybe on your own or in your employer's retirement plan.Then ...You find yourself lost in all the jargon and get-rich-quick schemes. You have no idea what to do. After some time, you give up and just let whatever money you have sit in a savings account earning no interest. Or worse - you ask somebody else to do it for you and trust it will turn out ok (hint - it won't). 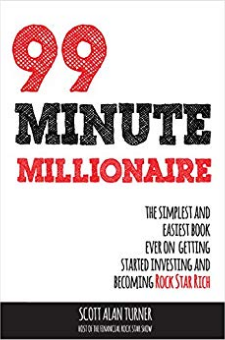 There are TONS of myths, misconceptions, and flat-out lies out there about how difficult it is to build wealth.99 Minute Millionaire busts those myths and challenges everything you’ve been told about investing. This book contains proven solutions that every new and experienced investor needs to know - no matter what financial challenges you face.99 Minute Millionaire Gives You The Path To Building WealthWhy many investors fail, and how you can ensure you don'tHow you can make the most money with very little workImportant decisions every investor should be aware of14 common and costly mistakes investors makeHow to manage your money like a proThe truth about financial advisors and investing professionalsAnd much more!Follow the advice given in this book and by the end, after putting what I have to say into action, you will be a better investor than most professionals.Best of all, the rest of your life doesn’t have to be put on hold to do it either!This book shows you how you can continue to spend most of your time doing what you love instead of struggling to manage your money.Before your buy the book, I have one question for you:What's stopping you from taking 99 minutes to improve the quality of your finances and put you on the path to financial freedom?